The fuel filter is an important component of the fuel delivery system of your vehicle. It makes sure that the contaminants, dirt, particles, dust, objects, and rust is prevented from entering the internal combustion engine by screening out all these contaminations. These particles are extremely damaging to the internal combustion engine, and if they are not screened and enters the engine they can even cause the engine to seize. As a regular maintenance and tune-up measure, the user should regularly change and replace the fuel filters. 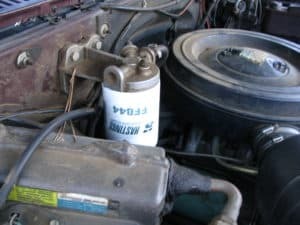 The process of replacing the fuel filter is easy and it can usually be done by going through an easy to follow guide. Usually, the replacement is done for most designs. However, some designs also allow you to clean the filter and use it again. Apart from causing damage to the engine system, the bad and old fuel filters can also cause clogging within the fuel line which can cut off the fuel supply. This can put pressure on the combustion engine as the engine endeavors to pull enough fuel, and it can also cause damage to the fuel pump. 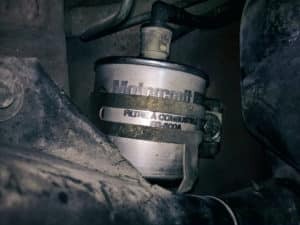 As we have discussed earlier, the fuel filter can develop problems sooner than we might think, therefore it is vital to know of all the signs that accompany a failing fuel filter. Here we will discuss the most common symptoms of a failing fuel filter. The fuel filter is supposed to keep sediments and other pollutants from reaching the combustion chamber. In order to achieve this, the fuel filter stores all the contaminants inside its own chamber but overtime this chamber can get clogged too and this results in improper delivery of fuel to the cylinders and thus you have difficulty getting ignition. When there is intermittent fuel reaching the engine, it is sure to misfire and experience hiccups. This can result in loss of power while accelerating the car. You will feel as if the throttle is not working at all and that the engine is about to shut down. If this is happening, constantly, even when your tank is full you should get a new fuel filter from your local mechanic. Modern vehicles have sensors placed on every square inch of the car, which transmit signals to the car’s computer telling it if something is going wrong with the car. The computer then illuminates the Check Engine light on the dash asking you to get the car checked. If the fuel filter goes bad, the pressure of fuel coming into the system will decrease which will alert the fuel pressure sensor and the Check Engine light will come on. You can reach the root of the problem by using a code scanner or going to the mechanic for a checkup. 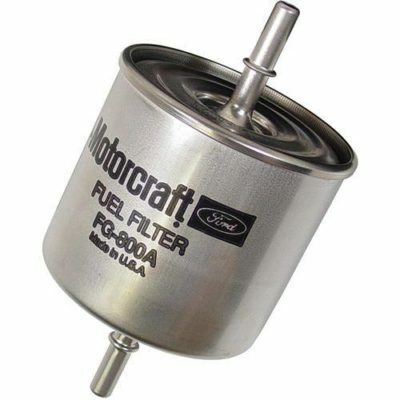 Most combustion engines use the fuel filter, which is in the form of cartridges that contains the filter paper. In all modern vehicles that use sophisticated systems, the fuel filter is an essential component with a vital function. there are several sources of contamination in the unfiltered fuel. The rust can enter the fuel from inside the tank if there has been moisture in the fuel tank. Apart from that, the fuel itself may contain contaminants before filling it in the fuel tank, or the dirt and other particles may enter at the time of filling. Most of the modern vehicles today use high-precision components that can get severely damaged with such contamination. These particles lead to very quick wearing, failing or seizing off the internal combustion engine. They can also lead to rapid abrasion inside the engine and damage the internal parts. It can also reduce the efficiency of the fuel and damage other parts such as fuel pump and fuel line. As a result, the fuel efficiency, as well as well engine performance, can be affected. Certain fuel filters are also capable of removing the water content from the fuel. These are normally installed in the diesel engines they are able to effectively draw the water out and drain it from the valve opening at the bottom. More sophisticated fuel filters may also contain sensors which can sense the water and transmit the recorded information to the control unit. The control unit is then able to express a warning signal to the driver as the water content can severely damage the engine, cause wearing and overheating of the engine system. The sensors are also able to indicate to the driver about when the water needs to be drained and when the engine is overheating. The fuel filter is very easy to remove but first, you need to find it. You will find it on the pressure line between the fuel pump and the fuel rail, the locations is often under the hood but can be found on many other places like under the car/near the fuel tank. Pour water or alcohol from the output of the filter to get the dirt out backwards. After this process, you have to make sure it’s 100% clean from any water or alcohol before installation, because if you get water in your fuel system, it may damage your fuel system and your car may now start. To reinstall the fuel filter simply join the two pipes back where they belonged and start your car, so that fuel can start to reach the filter. Keep in mind, though, that the filter is completely dry and there is no residue of water or soap inside it. There is no way to repair the fuel filter, however, even if there is, it is not wise to repair it since you can get another one very cheap. First, you need to check if the filter you cleaned is working or not. Simply start the car and wait. If the car starts without much ado, you were successful in your operations. If not, you need to consider visiting a mechanic. The location of the fuel filter may vary depending on your vehicle type and company. In case you have a fuel injection engine system in your vehicle, the fuel filter will most probably be located anywhere along the high-pressure fuel line. It can be found near the fuel tank under the vehicle. How to replace the fuel filter? Here is a step by step easy to follow guide on how you can replace the fuel filter by yourself. Locate the fuse box of your vehicle. Refer to the service manual to effectively find the location. How to diagnose a bad fuel filter? The best and easiest approach to know if it is time to change the fuel filter is to figure out when it was last changed. If it has been close to a year and the vehicle has started to show symptoms, you will know that the fuel filter needs to be replaced. You may also check the filter visually to see if the filter has gone bad. Some filters will have a window that will allow you to see inside. If the inside of the filter is dark, gummed and dirty, it is time for you to replace it. An old and bad fuel filter will also cause clogging, which will cause misfire, stalling and other symptoms to your vehicle. In case you cannot see the internal condition of the filter through the window, you can check the external condition. If it looks rusty and bad, you should replace it. The average replacement cost for Fuel Filter is between $60 and $225. The part can cost between $13 and $61, while the labour cost can vary between $50 and $160. The fuel filter installed in your vehicle is one of those components that require frequent and regular maintenance, replacement or repairing. In usual cases, a fuel filter can keep up with good results for as long as one year on average. However, people who have a heavy usage, longer drives and high mileage travel would require replacing it sooner than 1 year. The price for the fuel filter is reasonable and it can be easily replaced with a do it yourself user guide in the service manual if you have some basic knowledge about the system. The parts required for the replacement would cost you anywhere between $13 and $61 on average for most vehicles. However, if you are willing to hire a professional or a mechanic to do that, there will be a significant extra labor cost. Therefore, it is recommended to get it done along with the regular maintenance and tuning of your vehicle, in which the cost of labor for replacement can be adjusted or compensated. The mechanic can charge you an extra labor cost between $50 and $160 on average if you are getting it replaced separately. The total cost along with the labor charges can be around $63 to $225 on average.